"This journey will resonate with anyone who has braved the unknown in search of adventure-- and ended up finding themselves in the process." "[T]hrillingly romantic, smart and funny." "With an extraordinary setting, delicately rendered and well informed by Hubbard’s years as a guide to Central American travel on About.com, this becomes a wonderful story of kindred souls in a land of beauty, illuminated by Hubbard’s own drawings." "Neither goody-goody (one goal of her trip is to have an utterly meaningless sexual relationship) nor bad girl, Bria is a strong, principled young woman. A very good, very accessible novel." "Hubbard's second novel, following Like Mandarin, is rich with the unexpected joys and tribulations of new experiences ... Bria's charged relationship with Rowan and the vast emotional and physical territory Hubbard covers make for an evocative and romantic read." 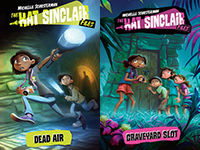 "Hubbard has crafted delightfully complex characters who are fresh and realistic... The romance between Bria and Rowan is constantly on a slow burn, leaving readers wondering until the end--will they or won't they end up together?" A companion book to Watch the Sky. "Just like Mila, this series opener is both smart and gutsy and I can't wait to see where the next installment takes us." ~ Marissa Meyer, New York Times bestselling author of Cinder "With edge-of-your-seat action and a shadowy government headquarters that puts Hollywood to shame, MILA 2.0 is a delicious, fast-paced read." "Twisted, and twisting. Relentlessly compelling. Lush storytelling. A must-read." "...haunting...Charm & Strange is a shocker of a page-turner that unravels brilliantly from both ends." "Charm and Strange is a story of blood and family and the animal inside—and it’s ferociously real." "Charm & Strange is, without a doubt, one of the best novels I have ever read... The book’s beautiful theme is incredibly executed." "[P]hilosophical and emotionally raw... The caustic voice, mysteries surrounding Win, and pervasive sense of dread should have readers racing to the end..."
"Debut author Kuehn comes out swinging with this confident, unnerving look at a damaged teen struggling with something violent inside of him." "[a] taut psychological thriller...difficult to put down." "Kuehn writes with the fleetness of a trained thriller author, blending past and present (not to mention psychology and action) with the same fluidity as in her Morris Award–winning debut CHARM & STRANGE. Her confidence is what’s so invigorating: every page makes a firm, surprising choice, whether you like it or not." "Readers will be hoping against hope for a happy ending, although it becomes less and less clear what that would actually entail. Halbrook’s debut features complex characters, and attempting to puzzle them out makes for a thought-provoking read." In development with Haven Entertainment! "Readers who persevere will see Corinthe progressing toward an understanding of love as she slowly becomes more human and realizes that order and obedience might not be the paramount ideals of the universe. An interesting read for patient romantic-fantasy fans." Now a major motion picture from CBS Films! "Another stunner for this up-and-comer! ... Whitley may be the prickliest of her heroines yet, but readers will commiserate with her as she figures out what she wants - and how to get it." Now a major motion picture from Summit Entertainment! 2012 YALSA "Best Fiction for Young Adults"
Winner BBAW 2011 "Best Book Club Pick," "Book You Most Want to See As A Movie," and "Favorite Book"
Amazon's "Best Books of 2011"
"Roth knows how to write... Roth keeps every chapter action-packed, moving Tris tantalizingly close to learning the secret her parents were fighting to unleash. The author has a subtle way of pulling readers into a scene (“The outside air.... smells green, the way a leaf does when you tear it in half”), and the novel’s love story, intricate plot, and unforgettable setting work in concert to deliver a novel that will rivet fans of the first book." "In this addictive sequel to the acclaimed Divergent... [Tris's] romance with Tobias is achingly tender and passionate, and her friends and enemies alike display a realistic spectrum of mixed motivations and conflicted choices. The unrelenting suspense piles pursuit upon betrayal upon torture upon pitched battles; the violence is graphic, grisly and shockingly indiscriminate... Anyone who read the first book was dying for this one months ago; they'll hardly be able to wait for the concluding volume." Amazon's "Best Books of 2012"
"Starglass is a richly imagined, beautifully written book. It's science fiction, mystery, and coming of age story all wrapped into one; creative but also firmly grounded in a real human experience, with all its loss, pain, and disillusionment—but also beauty, hope, and belonging. A wonderful story." "This richly textured first novel deserves to be widely read." "A poignantly lovely frame story about leaving Earth and a lonely kid seeking something to invest in." "With its onion-skin layers of plots and subterfuge around issues of trust and loyalty—not to mention a very strong writing style—this stellar debut should have strong interest from dystopian fans. Hand to fans of Maria V. Snyder or Beth Revis." "While there are certainly strong science-fiction overtones and dystopian influences, the claustrophobic nature of the ship grounds the characterization. This book offers an excellent resource to support diversity as marriage equality and LGBT issues are a dominant factor in the narrative, making it more interesting than many similar titles." ~ "Young musicians will be right at home with all the band details debut author Schusterman includes, and she’s just as on target when it comes to strained friendships, budding crushes, and science quizzes, too... Readers should be eager to check out Friends, Fugues, and Fortune Cookies, available simultaneously." "Believable, age-appropriate conflict and a plausible resolution make for an entertaining outing in the first of this band-related series. 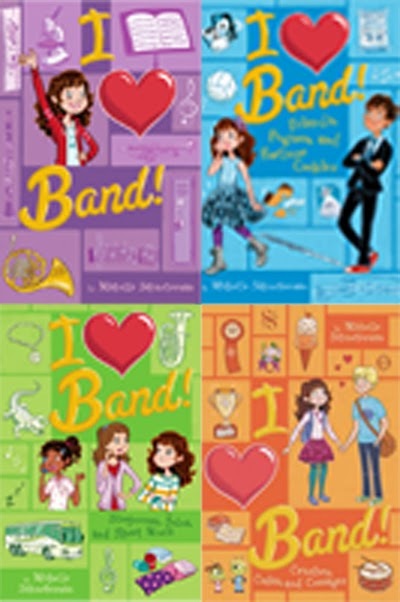 A cacophony of the emotional bumps of early adolescence that also perfectly captures the merits of band programs, this effort should appeal even to middle school girls who aren’t already musicians."